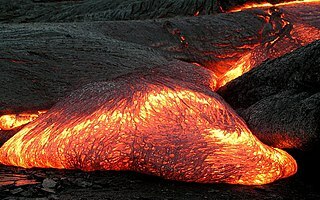 Magma is the molten or semi-molten natural material from which all igneous rocks are formed. Magma is found beneath the surface of the Earth, and evidence of magmatism has also been discovered on other terrestrial planets and some natural satellites. Besides molten rock, magma may also contain suspended crystals and gas bubbles. Magma is produced by melting of the mantle and/or the crust at various tectonic settings, including subduction zones, continental rift zones, mid-ocean ridges and hotspots. Mantle and crustal melts migrate upwards through the crust where they are thought to be stored in magma chambers or trans-crustal crystal-rich mush zones. During their storage in the crust, magma compositions may be modified by fractional crystallization, contamination with crustal melts, magma mixing, and degassing. Following their ascent through the crust, magmas may feed a volcano or solidify underground to form an intrusion. While the study of magma has historically relied on observing magma in the form of lava flows, magma has been encountered in situ three times during geothermal drilling projects—twice in Iceland, and once in Hawaii. An orogeny is an event that leads to both structural deformation and compositional differentiation of the Earth's lithosphere at convergent plate margins. An orogen or orogenic belt develops when a continental plate crumples and is pushed upwards to form one or more mountain ranges; this involves a series of geological processes collectively called orogenesis. In geology, the crust is the outermost solid shell of a rocky planet, dwarf planet, or natural satellite. It is usually distinguished from the underlying mantle by its chemical makeup; however, in the case of icy satellites, it may be distinguished based on its phase. The Laramide orogeny was a period of mountain building in western North America, which started in the Late Cretaceous, 70 to 80 million years ago, and ended 35 to 55 million years ago. The exact duration and ages of beginning and end of the orogeny are in dispute. The Laramide orogeny occurred in a series of pulses, with quiescent phases intervening. The major feature that was created by this orogeny was deep-seated, thick-skinned deformation, with evidence of this orogeny found from Canada to northern Mexico, with the easternmost extent of the mountain-building represented by the Black Hills of South Dakota. The phenomenon is named for the Laramie Mountains of eastern Wyoming. The Laramide orogeny is sometimes confused with the Sevier orogeny, which partially overlapped in time and space. A granitoid or granitic rock is a variety of coarse grained plutonic rock — granite or similar — which mineralogically is composed predominantly of feldspar and quartz. Examples of granitoid rocks include granite, quartz monzonite, quartz diorite, syenite, granodiorite, tonalite and trondhjemite. Many are created by continental volcanic arc subduction or the collision of sialic masses. Volcanic rocks are common with granitoids and typically have the same origins. However, they are normally worn away after years of erosion. The Congo Craton, covered by the Palaeozoic-to-recent Congo Basin, is an ancient Precambrian craton that with four others makes up the modern continent of Africa. These cratons were formed between about 3.6 and 2.0 billion years ago and have been tectonically stable since that time. All of these cratons are bounded by younger fold belts formed between 2.0 billion and 300 million years ago. The Grenville orogeny was a long-lived Mesoproterozoic mountain-building event associated with the assembly of the supercontinent Rodinia. Its record is a prominent orogenic belt which spans a significant portion of the North American continent, from Labrador to Mexico, as well as to Scotland. Magmatism is the emplacement of magma within and at the surface of the outer layers of a terrestrial planet, which solidifies as igneous rocks. It does so through magmatic activity or igneous activity, the production, intrusion and extrusion of magma or lava. Volcanism is the surface expression of magmatism. The Kalahari Craton is a craton, an old and stable part of the continental lithosphere, that occupies large portions of South Africa, Botswana, Namibia and Zimbabwe. It consists of two cratons separated by the Limpopo Belt: the larger Kaapvaal Craton to the south and the smaller Zimbabwe Craton to the north. The Namaqua Belt is the southern margin of the Kaapvaal Craton. The Cadomian Orogeny was a tectonic event or series of events in the late Neoproterozoic, about 650–550 Ma, which probably included the formation of mountains. This occurred on the margin of the Gondwana continent, involving one or more collisions of island arcs and accretion of other material at a subduction zone. The precise events, and geographical position, are uncertain, but are thought to involve the terranes of Avalonia, Armorica and Iberia. 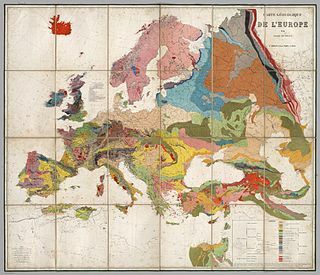 Rocks deformed in the orogeny are found in several areas of Europe, including northern France, the English Midlands, southern Germany, Bohemia, southern Poland and the southwest Iberian Peninsula. The name comes from Cadomus, the Latin name for Caen, northern France. L Bertrand gave the orogeny its name in 1921, naming it after Cadomus the Gaulish name for Caen in Normandy. He defined the end as being marked by Lower Palaeozoic red beds. The Wyoming Craton is a craton in the west-central United States and western Canada – more specifically, in Montana, Wyoming, southern Alberta, southern Saskatchewan, and parts of northern Utah. Also called the Wyoming Province, it is the initial core of the continental crust of North America. The Circum-Superior Belt is a widespread Paleoproterozoic large igneous province in the Canadian Shield of Northern, Western and Eastern Canada. It extends more than 3,400 km (2,100 mi) from northeastern Manitoba through northwestern Ontario, southern Nunavut to northern Quebec. Igneous rocks of the Circum-Superior Belt are mafic-ultramafic in composition, deposited in the Labrador Trough near Ungava Bay, the Cape Smith Belt near the southern shore of Hudson Strait and along the eastern shore of Hudson Bay in its northern portion; the Thompson and Fox River belts in the northwest and the Marquette Range Supergroup in its southern portion. Bimodal volcanism is the eruption of both mafic and felsic lavas from a single volcanic centre with little or no lavas of intermediate composition. This type of volcanism is normally associated with areas of extensional tectonics, particularly rifts. In geology, a slab window is a gap that forms in a subducted oceanic plate when a mid-ocean ridge meets with a subduction zone and plate divergence at the ridge and convergence at the subduction zone continue, causing the ridge to be subducted. Formation of a slab window produces an area where the crust of the over-riding plate is lacking a rigid lithospheric mantle component and thus is exposed to hot asthenospheric mantle. This produces anomalous thermal, chemical and physical effects in the mantle that can dramatically change the over-riding plate by interrupting the established tectonic and magmatic regimes. In general, the data used to identify possible slab windows comes from seismic tomography and heat flow studies. The East European Platform or Russian Platform is a large and flat area covered by sediments in Eastern Europe spanning from the Ural Mountains to the Tornquist Zone and from the Peri-Caspian Basin to the Barents Sea. Over geological time the platform area has experienced extension, inversion and compression. It has an area of about 6 million km2. The East European Platform sediments can be classified into the following groups: a "protoplatform" of metamorphosed sediments at the bottom, a "quasiplatform" of slightly deformed sediments, a "cataplatform", and a "orthoplatform" at the top. The Mesoproterozoic Jotnian sediments of the Baltic area are examples of a "quasiplatform". The oldest preserved continuous sedimentary cover in the platform date to the Vendian about 650 million years ago. The cycles of deposition of platform sediments are related to the development of nearby orogenies like the Timanide orogeny, the Uralian orogeny, the Hercynian orogeny and the Caledonian orogeny. A subduction zone is a region of the earth's crust where one tectonic plate moves under another tectonic plate; oceanic crust gets recycled back into the mantle and continental crust gets created by the formation of arc magmas. Arc magmas account for more than 20% of terrestrially produced magmas and are produced by the dehydration of minerals within the subducting slab as it descends into the mantle and are accreted onto the base of the overriding continental plate. Subduction zones host a unique variety of rock types created by the high-pressure, low-temperature conditions a subducting slab encounters during its descent. The metamorphic conditions the slab passes through in this process creates and destroys water bearing (hydrous) mineral phases, releasing water into the mantle. This water lowers the melting point of mantle rock, initiating melting. Understanding the timing and conditions in which these dehydration reactions occur, is key to interpreting mantle melting, volcanic arc magmatism, and the formation of continental crust. The Svecofennian orogeny is a series of related orogenies that resulted in the formation of much of the continental crust in what is today Sweden and Finland plus some minor parts of Russia. The orogenies lasted from about 2000 to 1800 million years ago during the Paleoproterozoic Era. The resulting orogen is known as the Svecofennian orogen or Svecofennides. To the west and southwest the Svecofennian orogen limits with the generally younger Transscandinavian Igneous Belt. It is assumed that the westernmost fringes of the Svecofennian orogen have been reworked by the Sveconorwegian orogeny just as the western parts of the Transscandinavian Igneous Belt has. The Svecofennian orogeny involved the accretion of numerous island arcs in such manner that the pre-existing craton grew with this new material from what is today northeast to the southwest. The accretion of the island arcs was also related to two other processes that occurred in the same period; the formation of magma that then cooled to form igneous rocks and the metamorphism of rocks. A-type granites are a class of granite. They are characterised by low water and a lack of tectonic fabric. A stands for anorogenic or anhydrous. The granite class was proposed by Loiselle and Wones in 1979. It was in addition to I-, S- and M-type granites. The North Atlantic Craton (NAC) is an Archaean craton exposed in southern West Greenland, the Nain Province in Labrador, and the Lewisian complex in northwestern Scotland. The NAC is bounded by the Nagssugtoqidian Orogen to the north and the 1.8–1.87 Ga Ketilidan–Makkovik mobile belt to the south. The latter can be linked to the Lewisian-Malin boundary in Scotland, which in turn can be linked to the Transscandinavian Igneous Belt in Baltica. The Grenville Province is a tectonically complex region, in Eastern Canada, that contains many different aged accreted terranes from various origins. It exists southeast of the Grenville Front and extends from Labrador southwestern to Lake Huron. It is bounded by the St. Lawrence River/Seaway to the southeast.